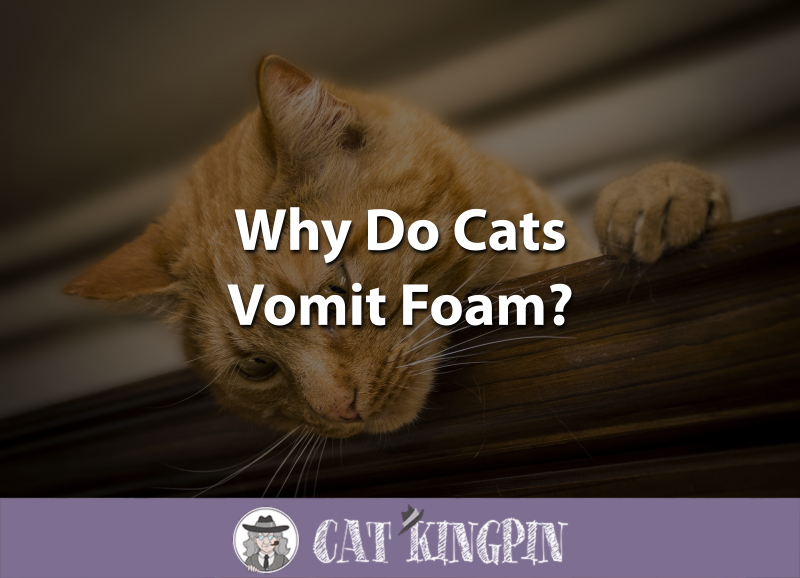 » Why Do Cats Vomit Foam? Can You Keep Kittens in a Cage? If your cat hasn’t done it before, it can be scary if they start vomiting. Especially if all that’s coming out is white foam. In some cases, such as when a cat is vomiting repeatedly, this can be a sign of serious illness requiring prompt veterinary attention. But for the most part, vomiting foam isn’t cause for concern. Vomiting is a forceful expulsion of the stomach contents through the mouth and, less commonly, the nose. Often, when a cat or kitten throws up, it’s a reaction to stomach discomfort and nausea. Unlike dogs, cats haven’t been seen regurgitating food for their young. Vomiting is not normal for cats, and can be a sign of something as simple as a tummy ache or a serious medical condition. There a variety of reasons cats might vomit foam. If you’re unsure as to why your cat vomited, or they’re repeatedly vomiting, take your cat to your vet immediately. If your cat hasn’t eaten for a while, their stomach will eventually be empty of food. When this occurs, stomach acid and bile build up, leading to nausea and irritation in the lining of the stomach. Eventually, your cat may throw up white foam along with yellowish bile. Vomiting up bile is generally not serious and usually the cat will feel better once they’ve eaten. Just be aware that a cat’s stomach can still be upset for a while right after they vomit. It may take them a minute to be ready to eat their food. For this reason, you should always offer small amounts of food when your cat has an empty stomach. Many cats throw up hairballs at some point in their life. Some are more prone than others, such as long-haried cats or those that excessively clean themselves. Hairballs form from the hair swallowed when the cat grooms itself. Sometimes, a cat having trouble throwing up a hairball will vomit up foam before it gets the hairball out. Other symptoms your cat may experience if it’s having trouble with a hairball include constipation and and lack of appetite. If your cat has hairball issues, you should consider putting them on a diet formulated to reduce hairball formation such as Blue Buffalo Hairball & Weight Control. Another option you can try is Organics Hairball Remedy, which is specially-formulated to prevent and aid in the elimination of hairballs. A number of gastrointestinal illnesses, such as inflammatory bowel disease and enteritis can cause your cat to vomit up foam. Both are serious medical conditions that warrant a visit to your veterinarian. Veterinarians have developed many treatments and diets that can help cats with gastrointestinal diseases live long and comfortable lives. Cats are much less likely to ingest foreign objects than dogs. Many dog owners have found themselves paying hundreds of dollars for emergency surgeries to remove socks, toys, or even corn cobs from Fido’s stomach. If your cat is vomiting foam and you think they swallowed a foreign body, take your cat to the vet immediately. Your veterinarian will most likely take an x-ray to determine whether surgery will be needed to remove the object. There are a number of other less common causes that can result in your cat vomiting up foam. Examples include chemicals, hormone deficiencies, and rabies. If your cat is vomiting foam and you suspect they may have ingested a chemical, this can be a medical emergency and you should contact animal poison control at once. If you’re able to do so safely and quickly, identify the substance your cat ingested, then seek veterinary care immediately. Certain hormone conditions, such as adrenal gland disease, also have symptoms that include vomiting up foam. Rabies, a viral infection, cause your cat to gag and foam at the mouth which can look very similar to vomiting up foam. If you don’t know why your can is vomiting foam, err on the side of caution and take them to the veterinarian. In many cases, a simple blood test can get to the cause of your cat’s condition. So, why do cats vomit foam? As we have seen, there are many reasons a cat might vomit foam. Some are relatively minor, while others can by signs of a serious medical issue. Unless you know your cat hasn’t eaten in a while and the vomitous is a mixture of foam and bile, you should take your cat to the vet to make sure it’s nothing serious. What did you think of this post? If you have any questions or would like to share a story about your cat and something that made them vomit, please tell us in the comments below! We’d love to hear from you.